Upcoming triple camera phones list leak; Xiaomi Mi 9, Oppo R18 Pro, Vivo X, Huawei P30 Pro to use Sony IMX 586 sensor? The Huawei Mate 20 series made some heads turn, with its triple rear camera system, and will soon be followed by the Honor Magic 2. And it appears that more triple camera phones are coming in 2019. The leaked list looks to be part of a Supply Chain Document which includes data from Sony, OVTI and GF Securities. 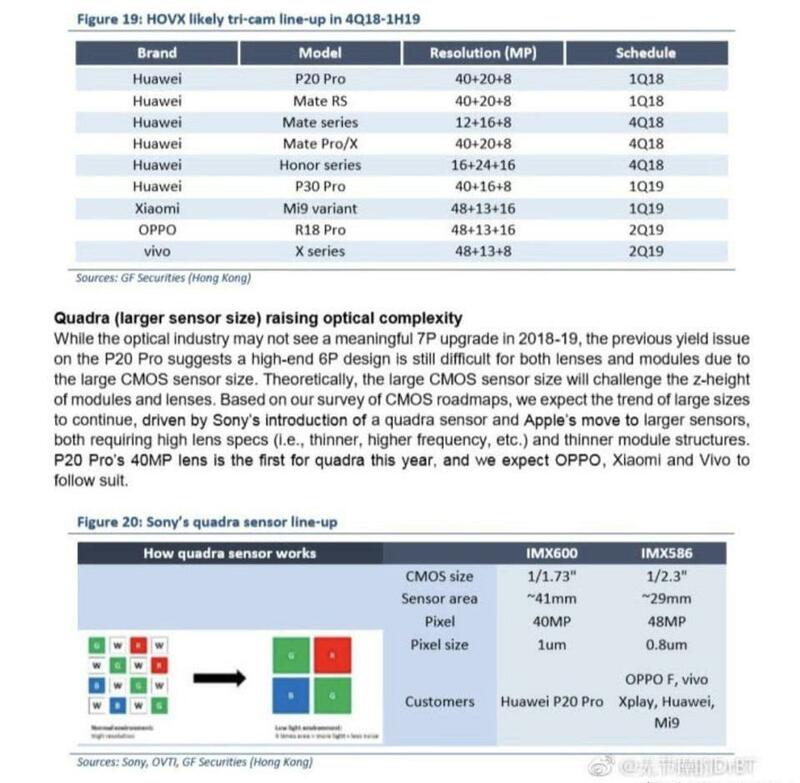 According to the report, at least four upcoming flagship devices will feature Sony’s Quadra sensors. All of the aforementioned devices will be equipped with 7P lenses with a Sony IMX 586 sensor that has a 1/2.3 CMOS Size, 29mm sensor area, and a 0.8μm pixel size. The leak reveals the specifications of the primary lens set up in the triple camera phones. The Huawei P30 Pro will feature 40MP + 16MP + 8MP cameras, while the Xiaomi Mi 9 and OPPO R18 Pro will sport 48MP + 13MP + 16MP lenses. The Vivo X will pack a triple lens array comprising of 48MP + 13MP + 8MP cameras. The ETA for the device launches is also quite interesting. The Huawei P30 will be launched in Q1 2019, as will the Xiaomi Mi 9. The Oppo R18 Pro and a new Vivo X series device will be announced in Q2 2019.